The National Weather Service forecasts a low potential for tornadoes on Friday. The potential for tornadoes is low or very low across most of the state. There is also the risk of flash floods across most of central Oklahoma. The National Weather Service is forecasting more severe weather on Friday. There is a low potential for tornadoes and an enhanced risk of severe storms in the southeast of the state, including Ada. The severe storm risk is low in the Oklahoma City metro area and very low in the northwest, including Woodward. The National Weather Service also warns of two to four inches of rainfall that could lead to flooding. The risk of flash floods in central Oklahoma is moderate, and in most of the rest of the state, the risk is low or very low. Residents of central Oklahoma reported damage to trees, buildings and roads as a result of high winds and rain on Thursday night. Oklahoma Gas and Electric reported more than 9,000 customers without power as of 10:51 a.m. on Friday, almost all of them in Oklahoma. We have 560 crew members on the ground working to restore power. Additional crews are on the way from Arkansas and Texas. This post was updated on Friday, May 19, 2017 at 11:07 a.m. Rain pours on Little Sahara State Park in northwestern Oklahoma on Thursday, May 18, 2017. A storm nears Camargo, in western Oklahoma on Thursday, May 18, 2017. A series of severe storms brought at least five tornadoes to the state on Thursday. As of 7:48 p.m. on Thursday, the National Oceanic and Atmospheric Administration reported three tornadoes in northwestern Oklahoma east of Woodward, one in southwestern Oklahoma and one in western Oklahoma near New Cordell. A NOAA map also reported hail as large as 2.75 inches in diameter and winds as high as 104 miles per hour, both in southwestern Oklahoma. Newscasters, storm chasers and other observers noted huge cloud formations and large hail across the state. 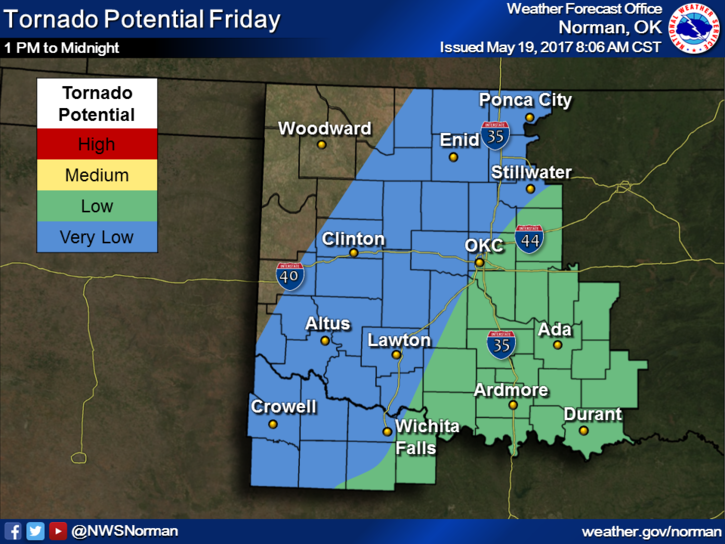 The National Weather Service warns that more storms are expected on Friday, with an enhanced risk for tornadoes across the entire central portion of the state, including Woodward, Oklahoma City and Ada. There is also the risk of flash floods, with two to four inches of rainfall expected across much of the state. This post was updated on May 18, 2017 at 7:48 p.m. The risk of severe storms across Oklahoma has increased. The National Weather Service is now predicting a high risk of severe storms in the central northern part of the state, including Woodward. Further south, in Oklahoma City and Stillwater, the risk is moderate. National Weather Service meteorologist Jonathan Kurtz described the forecast as "very complicated." "We expect numerous thunderstorms to develop through the afternoon hours and into the evening, with several strong to significantly severe thunderstorms developing across the area," Kurtz said. Kurtz says storms should begin to develop between 1:00 p.m. and 3:00 p.m. across west north Texas and into southwestern Oklahoma. At first, these storms will primarily bring a wind and hail risk, but by the mid-to-late afternoon, the risk for significantly severe storms will spread into northwestern Oklahoma and into Kansas. This post was edited On May 18, 2016 at 4:21 p.m. There could be hail as large as softballs, and winds up to 80 miles per hour. The overall potential for tornadoes is high, according to the National Weather Service. The potential is highest in central northern Oklahoma, including Woodward. Further west, south and east, the potential for tornadoes is medium. And to the southeast, including Ada, the potential is low. The National Weather service warns that residents of all areas should be careful about weather, regardless of warning level. Please don't get hung up on outlook lines and colors today. Bad storms can happen outside the high risk area. Complex forecast. Stay alert! Storms are expected to arrive in the western part of the state between 2 and 7 p.m. and move eastward, hitting the Oklahoma City area between 4 and 10 p.m. and reaching Ada after 8 p.m.
More storms are possible on Friday, with a medium potential for tornadoes. The risk of severe storms is enhanced in the Oklahoma City area, as well as in northeastern and southwestern Oklahoma. The risk is slight in the rest of the state. 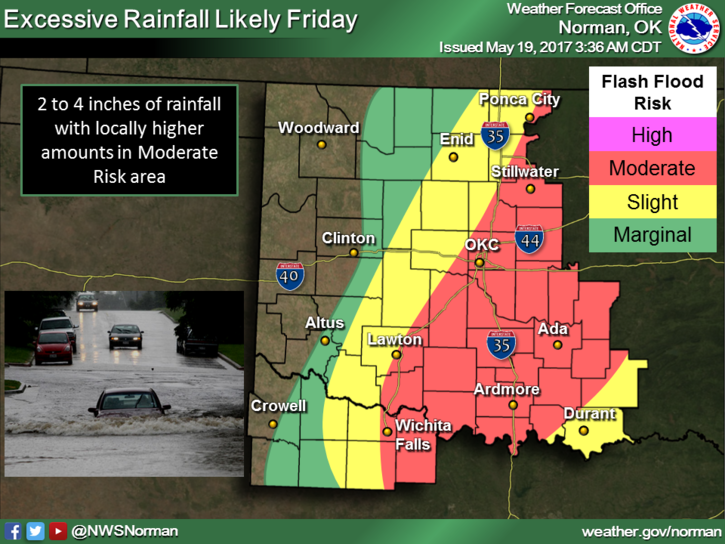 There is also the risk of moderate flooding in central Oklahoma, with a slight risk of flooding to the northwest and southeast. 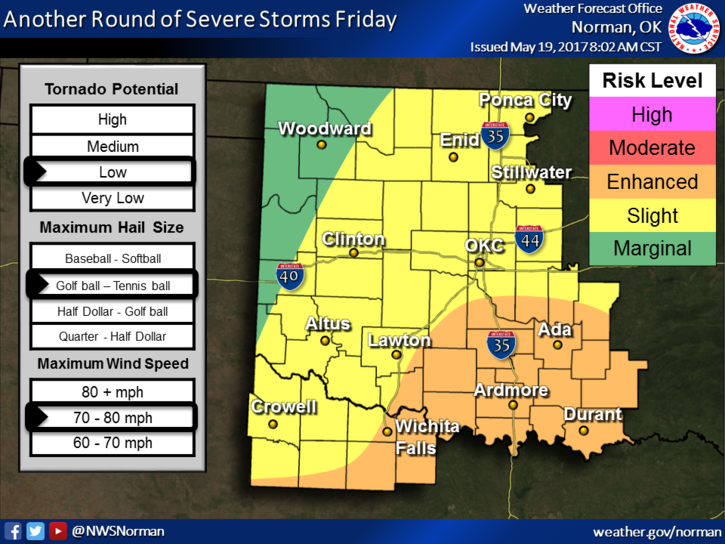 This post was updated on May 18, 2017 at 10:43 a.m.
Another round of severe weather is expected to move across Oklahoma on Thursday and Friday, bringing a chance for strong thunderstorms and tornadoes. The northwestern corner of the state, north of I-40 and including the towns of Clinton and Woodward, has a "moderate" risk level for severe storms, the second highest threat level used by the National Weather Service. National Weather Service meteorologist Jonathan Kurtz says thunderstorms will develop along a dry line on Thursday afternoon along the border of Oklahoma and the Texas Panhandle. "The greatest focus for severe storms will be across the western and northwestern portions of Oklahoma," Kurtz said. "These thunderstorms will be capable of large, damaging hail up to the size of baseballs and damaging winds, along with a risk for developing tornadoes." The greatest chance for tornadoes will occur Thursday afternoon and evening in far northwestern Oklahoma. The Oklahoma City area will be in an enhanced risk for severe thunderstorms on Thursday afternoon and night. More storms are possible Friday afternoon into the evening hours. The greatest threats are large hail, damaging wind and flooding. Tornadoes are possible. Storms could produce excessive rainfall into Saturday morning, especially in south-central and southwest Oklahoma. "As storms build across the area through the evening overnight hours, the threat of flash flooding could lead to major impacts such as flooding roadways and quick rises on creeks and streams," Kurtz said.